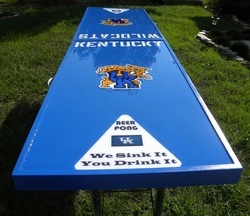 The cost for a table similar to this Kentucky Wildcats table is $200. 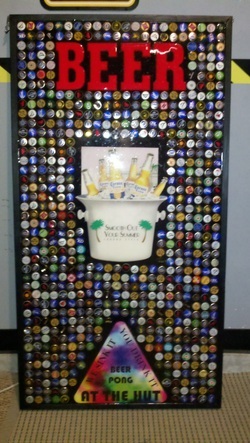 This table has roughly 1,250 beer caps, two metal signs, and 24 coasters all encased in a glaze that makes the table top smooth and fun to play on. It looks very cool and you are still able to bounce the balls. The table is free standing and folds for easy storage. The unfolded dimensions are 8ft x 3ft and folded it is 3 1/2ft x 3ft. We offer custom made tables designed to fit your needs. 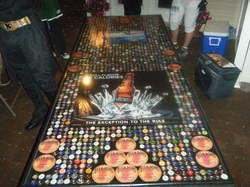 With close to 1,300 Bud Light caps and 20 Bud Light coasters this table is the ultimate for Bud Light fans. Folding legs and the ability to separate the sides make for easy transport to all your parties. Shown on the Home page this is my personal table. Salisbury Pride raffle table! Cost for a similar table $250. All the decals on this table are custom!